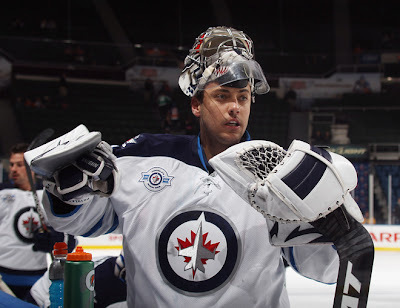 Ondrej Pavelec was charged with a DUI in the Czech Republic before signing a five year contract with Winnipeg. The signing of their undisputed number one netminder Ondrej Pavelec this off-season to a multi-year deal was the climax and biggest accomplishment of the first few weeks of the aptly named "Free Agent Frenzy" for the Winnipeg Jets and GM Kevin Cheveldayoff. But what they didn't know occurred in Pavelec's personal life was what hurts the most. Is Ondrej Pavelec the Dr. Jekyll/Mr. Hyde type? Or did he have a serious lapse in judgement? Having been written off as a lack of character for such a young man, Pavelec's reported DUI charge in his native Czech Republic has set off fires all over Winnipeg and the NHL. But what matters most is - he was not entirely honest with his team, teammates, and fans. For Jets owner and governor Mark Chipman, this does not sit well whatsoever. Chipman's mandate throughout the duration of True North Sports & Entertainment's reign in Winnipeg has been accountability, respect, and honesty. For Pavelec, he broke all three of Mr. Chipman's golden rules. B. He lacked the respect of himself by driving while heavily intoxicated and therefore lacked respect for others that could be in harms way because of his actions. C. And he did not fully disclose his actions until weeks after he signed his contract of which Mr. Chipman pays 100% of. So - long story short - there is no reasonable assumption that can be made to say that Mark Chipman is not very happy with his start goalie. The scene of a fatherly talk to Pavelec by Chipman may be stretching it a little too thin in this case. Of course, Chipman's brand of hockey through True North has had a bit of a stain being cast upon it. Last summer, it was incoming star Dustin Byfuglien with a DUI while boating, but that was a different situation entirely - the Jets players were not fully cemented into the community and Byfuglien had not freshly signed a new long-term contract. The hockey world should not look any differently on the Jets franchise or True North whatsoever, since it was Pavelec and agent Allan Walsh who were so tight lipped about anything that my have happened until weeks later. Assuming Walsh knew about Pavelec's behaviour, it would have indeed slowed negotiations, but it would have been for the better for both sides to have everything out front. Once again - True North = accountability, respect, and honesty. Ondrej Pavelec has apologized for his actions, but now he needs to put those words into actions. And with True North, it's not the normal three strikes and you're out rule. I'm thinking one more strike and things could look much different in the Jets net.